Our 8th grade students return to Sundays for a hands-on, social action-focused program. Our year is dedicated to social justice, a core value of Reform Judaism and at the heart of who Shaare Emeth is as a community. For each unit, we focus on a specific social justice themes, including poverty and hunger, racial justice, inclusion, and more. After our students gain a strong foundation in the issues, they go out into our community to get their hands dirty and participate in projects to create change on the issues they are studying. We don’t just talk about hunger—we help our local food pantry prep for the winter months. 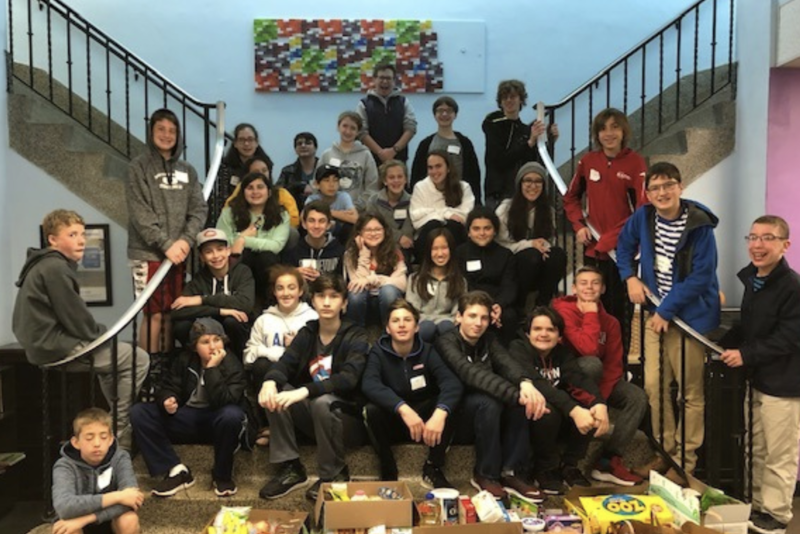 We hope that this experience gives our 8th grade teens a broader perspective on the need to pursue justice and a strong belief that every person can make a difference. In addition, 8th graders are eligible for our (optional but awesome) MIT Program, Madrichim in Training. They go through a series of skills-based trainings and important conversations so they can become teaching assistants in our Religious School.